Sizes and bevels were taken and the ladder made up and measured carefully, on completion it was stripped and hot dipped galvanised that gives it a minimum of 20 years free of maintenance. The ladder is also in an awkward corner with no easy access to be gained, so the ladder was made up in hand-able sections that could be hand carried to the site position. 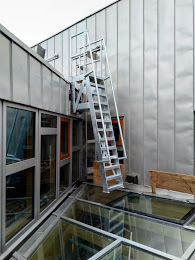 The final problem was that the ladder is actually suspended above the glass roof and isn't supported at the base. Well done to all those concerned for this bespoke job. 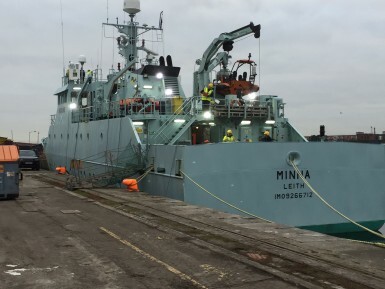 An early start to 2019 with the arrival in Leith of the Fishery Protection Vessel Minna in preparation for a wet dock refit. The Minna generally works on the West Coast of Scotland out of Greenock carry out fishery protection duties for the authorities. With the changes to the fishing quotas and the new fish dumping regulations she's likely to be busy when she returns to service later this month. The refit work consists of some tank work, replacement of some valves and some general repairs. Elsewhere in our website there are pictures of an earlier Minna berthed outside our workshops, I'm told that vessel had a pock marked funnel fom enemy action received durring the 2nd world war? The FRY Britannia is developing a new guest accommodation ship that is now permanently berthed in the old Alexandra Drydock that we previously used for ship repairs. The new vessel is the "Fingal" that was originally built for the Northern Lighhouse Board. She has been extensively remodelled with additional new decks to suit her new role. We have been contracted to manufacture three new gangways for the vessel that are to be used for all three access points to the vessel. 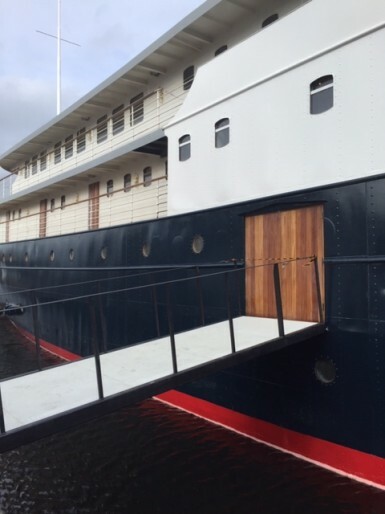 The gangways are now fitted but still to be completed with painted glass fibre side screens and teak handrails that are made from recycled timber previously removed from the ships decks. 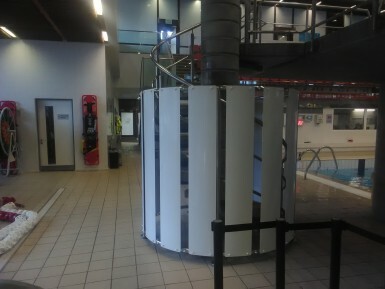 Our engineering and sheet metal departments worked hand in hand to modify existing stainless steel tubular security cages around the stairways up to high diving boards at the Royal Commonwealth Pool in Edinburgh. The existing metal work was being damaged so we came up with arrangement of curved sheet metal panels secured in place with larger screws. All powder coated prior to installation. Hopefully it should last a long time. We attended a vessel at Grangemouth last week to undertake the welding down of sea-fastening fixings. 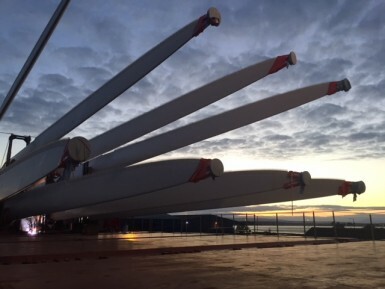 The cargo of large windmill blades was loaded by shore side cranes and then secured in position by welding down stoppers to stop the cargo moving and then Dee rings to allow securing chains and lashings to be fitted by the ships crew. The blades are transported in lifting / supporting frames to ensure the blades are properly supported during transportation around the world, however even when stationary the blades "waggle" around. The blades are generally made from fibre glass with various protrusions moulded into them to reduce static charges and to stabilise the blade. After much detailed planning and preperation we have now started work on a customers site carrying out maintenance on a large carousel that is approx 20m in diameter and weighs 160 tonnes. The carousel has been in use for ten years and the suporting rails on which the carousels wheels run on, had started to suffer as it can accomadate several thousand tonnes when loaded up. The empty carousel was jacked up using a hydraulic jacking system that uses a supporting timber matrix. Once raised by two metres, solid steel supports were inserted and the jacks removed. The two rings of rails have been lifted and the old supporting grout removed. The plan is to accurately level the old rails and then re-grout them with an epoxy grout prior to the reversal of the lifting process. The machine shop is always having to adapt their machines to accept differant types and sizes of jobs. The picture shows a large end bearing housing from a ships generator that had a worn bearing housing. The plate would'nt fit our Webster Bennett vertical borer, but it just squeezed into the three axix bed mill. The cast iron end plate was bored out to accept a new steel bearing housing that was pulled into place and securred with some drilled and tapped "Yankee" feathers. The final steel insert was then bored to suit the bearing size given and finally honed to size prior to delivery over the weekend. 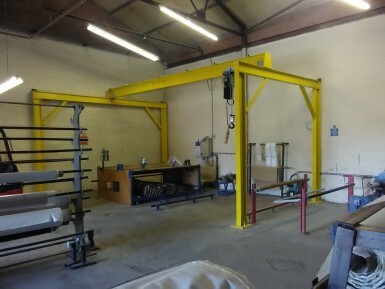 Our Fabrication and Lifting Gear departments worked together to fabricate, install and certify a simple workshop lifting gantry complete with a two tonne electric hoist for one of our local customers. The space was measured and customers requirements acertained to allow fabrication drawings to be produced for its manufacture. Over a weekend the space was cleared and the steelwork erected. The frame was securred to the ground and base plates grouted, electric hoist was installed and a new electrical supply cable with isolator fitted. Once complete the final assembley was proof load tested and certified for use. 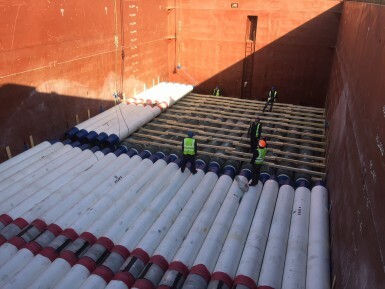 We started a job helping with dunnage and cargo securring on the first of five ship loads of coated pipes yesterday. 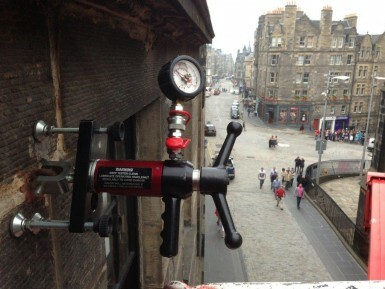 The pipes are coated in Leith with concrete and some are coated with Multi Layer Polppropylene. Each pipe weighs around 7 tonnes and they are loaded two or three at a time onto timber dunnage that prevents damage to the coatings. 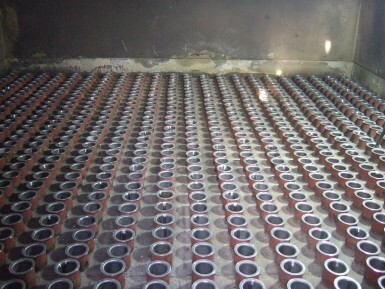 Th Polypropylene pipe coatings are quite delicate and cannot be loaded onto the concrete pipes as normal. To prevent damage twelve strips of timber are laid over the concrete pipes for the other pipes to sit on. On completion we use ratchet straps to secure them in place and any gaps are filled with timber to prevent any movement of the cargo while at sea. The ships are Rusich Class river vessels that are 130m long but quite narrow at 16.5m which allows them to navigate the Russian rivers and canals. The pipe cargo is destined for Baku in Azerbaijan which is on the Caspian Sea. 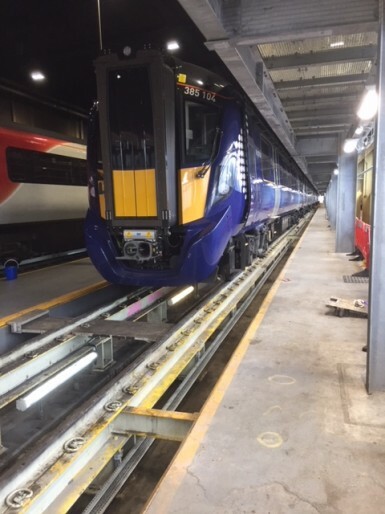 Our ongoing work at a local railway depot has seen the infrastructure modified to receive the new Class 385 type trains. These are electric multiple units being built by Hitachi Rail for operating in Central Scotland. The maintenance bays have been modified to suit the new vehicles with the addition of a raised access platform so that work can be safely undertaken on the vehicle roofs beside the eletrical supply cables. Everybody is trying to save on there fuel bills and carbon emissions, One of our regular customers has calculated that by fitting an additional heat exchanger in a return sump they can save a little bit more. The unit is made from standard fittings, and was pressure tested prior to fitting durring their weekend break in production. 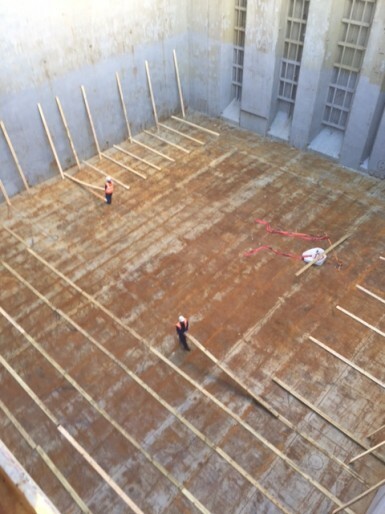 The sump is 4.5m deep and had to be pumped out prior to squeezing the unit, plus scaffolding down a small access panel that had to be formed in the flooring above. The unit will be fed from the water mains before feeding their boilers. We have made these stainless steel (grade 316) trunnion tubes many times for a local pharmaceutical manufacturer. They are made from 3" OD heavy wall stainless steel tube and we weld on the bearing housings, the tube branch and associated flanges and sockets. The welding is carried out to a predetermined proceedure to prevent heat distorion over the length. The welded tube is then set up and finally machined between centres to suit the bearing surfaces at either end of the tube. Finally pickled and cleaned before despatch. Typical of the fabrication and machining service we provide. Health, Safety and Quality are important in both maintaining and attracting new customers on which the Company depend to carry on trading. Our HSQ Manager continuously monitors our performance and we are assessed & audited for the quality standard BS EN ISO 9001-2015 by an outside auditor from the registration Company FQM Ltd. 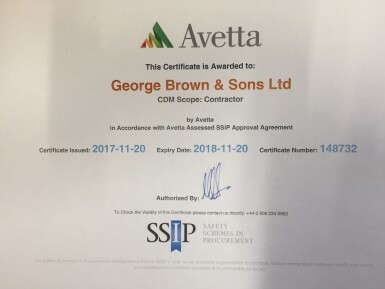 In addition to this, many larger Companies who we work for insist that we pay for accreditation with other Safety & Quality Procurement systems that they adhere too. There are many of these systems and we have recently been accepted by Avetta & Construction Line which supplements the many others we subscribe to. This time of year is generally quieter with many off enjoying the festive period. The Company does not shut down totally apart from the statutory days, not so long ago we used to work Christmas day but thankfully we get some time off nowadays. We have a small number of people who are working carrying out some planned and some unplanned work. 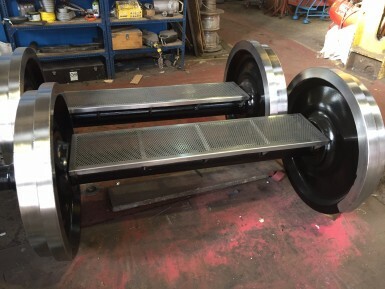 The main job is installing 50 tonne hoists ready for a shut down in early January, The powered trolley shown below, that weighs around one tonne, requires some minor adjustments that are best done in the workshop as access on site is awkward and limited. Once adjusted it will be reassembled with the 50 tonne air hoist and positioned on the load beam high up in the customers factory. 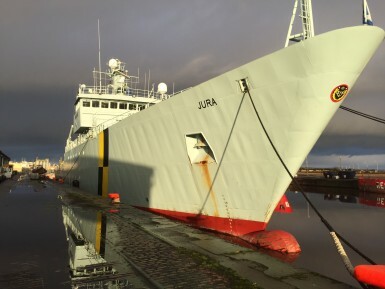 We are currently undertaking a small refit aboard the MPV Jura which is operated by Marine Scotland , she carries out marine law enforcement and fishery protection work for the Scottish Goverment. The vessel is 84m long and is diesel electric powered . We are pressure testing coolers on the diesel engines and drive motors along with some tank cleaning and other repairs. The major job aboard is removing the main gearbox cover to allow bearing renewal and clutch work which is scheduled to take two weeks. We have been carrying out work installing and refurbishing lifting tackle and assorted gear since the origonal days of George Brown & Sons back in the 19th century! 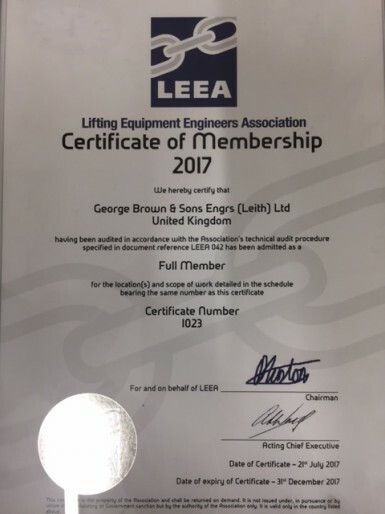 As with many industries, the tracability, training and competencies of this trade have been under scrutiny and after several years as a Development Member of LEEA (Lifting Equipment Engineers Association) we are delighted to have had our membership status upgraded to Full Membership. Several of our employees have now passed the various exams and tests required for LEEA to award them their Team Cards which proves their ability and proficiency to undertake the jobs required to their high standards. Along with an audit of the office procedures and test equipment, LEEA have successfuly steered us through the required process's. Gaining Full Membership of LEEA will give additional comfort and support to our valued customers. We regularly undertake cargo securing work board vessels that are loading large items of expensive cargo. The cargo must be secured to prevent it moving when the ship rolls or pitches in heavy weather or is involved in a collision or runs aground. On this job, the large reel weighing around 130 tonnes was loaded by the ships cranes and placed on rubber matting to spread the load and increase the friction to prevent it moving. We then have to weld against the base plates, numerous stopper plates to prevent it moving and Dee rings for numerous chain lashings that have to be fitted to hold it securely. 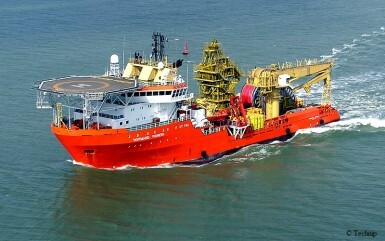 On completion the work is checked by the vessels Captain and a surveyor. 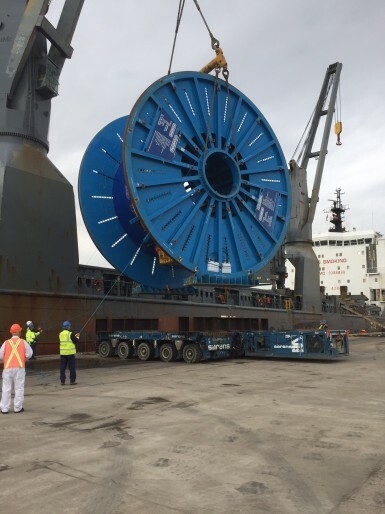 This reel is being transported to Egypt as part of a large oil and gas project. The ship must pass through the Bay of Biscay which is notoriously rough! We have just completed the overhaul and refurbishment of a tarmacadam mixing machine for Cemex who operate plants through out the UK. The job involved stripping out worn drive shafts and bearings external to the mixing chamber, and the mixing paddles that are inside the mixer body. The machine was locked out and isolated to allow the work to proceed safely. The work inside the mixer was particularly dirty and all the connections were coated with old tar from years of use. Once the old components were removed the new paddles were connected to new shafts driven by twin drive motors and gearboxes with gear wheels to keep the two aligned. 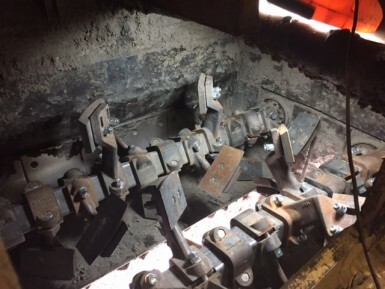 A tight schedule was met by working overtime on site and in the machine shop which modified new couplings that were procured from Germany to replace items not expected to be worn. We are busy assisting with cargo work on some large bulk carriers that are loading pipes that are to be transported to Italy. We have to layout each of the cargo holds with "Dunnage" before the cargo loading can be started. Dunnage is timber that protects the cargo and allows for some settling on the uneven surface. As the cargo is loaded we have to place timbers in any large gaps, and on completion of all the cargo, finally we secure the top pieces in place with timber and wedges to the satisfaction of the Captain and the cargo surveyors, this is called the tomming off and is to prevent the cargo shifting in heavy weather which could capsize the ship. 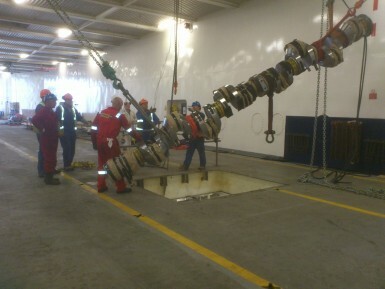 The hold bottom is 15m below deck level and is accessed via ladders. Keeps you fit, but its a long day going up and down in all weathers. Our Lifting Gear Department get some interesting and sometimes challenging jobs to carry out. 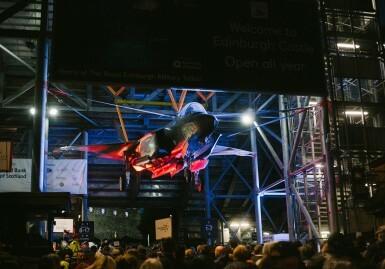 Last week they are asked to see whether they could assist in rigging and slinging a 10 tonne F35 jet fighter above the main enterance to Edinburgh Castle Esplanade for the annual Royal Edinburgh Military Tattoo. All the work was carried out over two night shifts, on the first night purpose bought clamps and slings were erected along with three spreader bars to the main steelwork of the main stand. On completion the set up was all load tested using dynamometers and fully checked and inspected. The next night once the castle was closed and the public left, the jet was deliverred in numerous shipping containers to the esplanade where the Military personnel commenced the assembly. Because of the width restrictions the main fuselage was rolled into position underneath two Bernard Hunter cranes and the wings finally bolted into position. The cranes then carefully lifted the plane up into position and the slings attached to hold it in position. Sounds easy, but at 5am it was touch and go and major decisions had to be made to ensure the project could be completed before the castle traffic commenced a couple of hours later! The end product is dramatic and the picture (Credit, The Royal Edinburgh Military Tattoo) shows the effect of the jet swooping down to land as you approach the Castle. Daily, thousands of visitors pass underneath it on there way to visit Edinburgh Castle or to attend the excellent Tattoo each night. Well done all involved for undertaking a challenging project safely over two long nightshifts at the weekend. Our customer had bought in a flare stack to burn off excess gas produced by their product in there recovery system and required it to be installed on site. 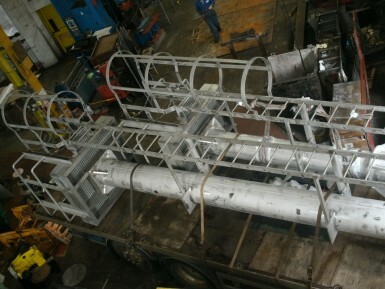 Several new galvanised pipe supports stands were made to run the pipes safely. 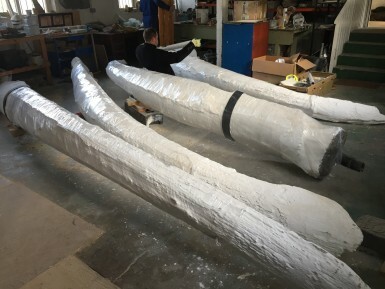 The pipework was jigged up on site and TIG welded before the final connections were carried out followed by testing and final commissioning by the makers. 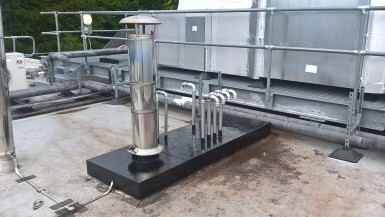 We completed the work modifying boiler flue and vents in a local hospitals plant room at the weekend. All vents and the fue were cut back and the roof plate ut and modified as required. The roof was then rewelded, sealed and painted, thankfully it was a dry sunny day for the final roof phase. A beautiful sunny Friday evening on a Bank Holiday Weekend saw the bars and restaurants crowded with patrons. We however are busy cutting steel and transferring it to Rosyth where we are working night and day repairing critical equipment that has 2000 tonnes sitting on it unable to move due to foundation troubles. The job is in a dusty and hot confined space where you can only crawl around. We have installed twenty 100 tonne hydraulic jacks through four pumps and manifolds to allow the load to be lifted and re-supported. The passing public were surprised to see us working and stopped to see what was going on through our sliding fence which keeps everyone at a safe distance. 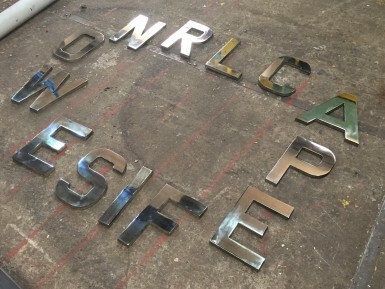 We received some cast bronze letters (12" high) from a customer that they required to be drilled and tpped for mounting, and the surface machined and polished to a high finish. The surface was surface ground by the auto departments surface grinder that is more commonly used for machining car engine cylinder heads and then the sheet metal department polished the surface to a mirror finish on the polishing spindle to achieve the final bright finish. The picture shows the letters as an anogram, see if you can work out the name of the ship! CLUE; its an aircraft carrier and sister ship of the Queen Elizabethl. One of our customers requested that we modify a pair of their old worn railway carriage wheels into some garden seats for them. The two axles with attached wheels were fully dressed and painted before the exposed wheel rims clad with polished stainless steel. The new seats were made from stainless steel perforated plates which were fitted with securing brackets to the axles. Special ground mounting brackets were also made and suplied so that the completed seat can be safely secured in place. 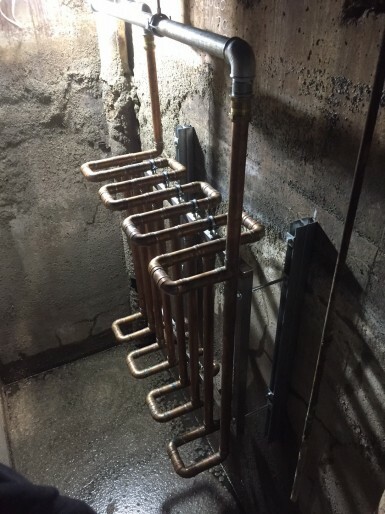 We have been assisting with the manufacture of some large bore pressurised hot water pipework to allow the connection of a temporary boiler situated in a hospital carpark. 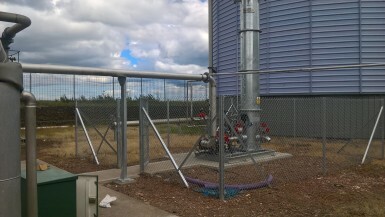 We have fabricated and off site pressure tested all the pipework and penetrated the flow and return pipework to the existing energy centre (in the back ground). 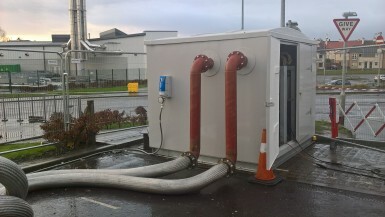 The glass fibre Kiosk was made and mounted on a galvanised steel frame which incorporated new flow and return headers with double valve and drain connections, expansions bellows, along with presure guage connections, flushing valves and dosing points. 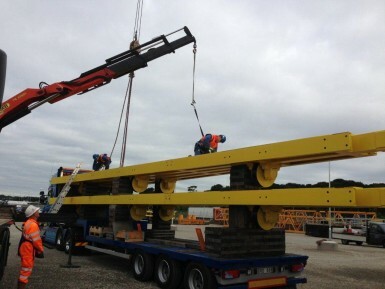 The complete module was transported and lifted into position in the carpark using a Hiab truck. The temporary boiler whilst being temporarily connected with 6" flexibles will shortly probably be connected with steel pipework and lagged for the duration of the works. Heat exchanger work completed on time. Since the 5th January we have been working to complete the repairs to a gas heat exchanger. The customer wanted the top 3m of the 76mm diameter tubes cut off and renewed, along with the tube plate in way. The photograph only shows half of the job that had 1,584 tubes in total, the same number of holes that had to be cut in the new tube sheet! All the tubes were screwed onto welded sockets made and fitted to the good remains of the old tubes. All carried out at the top of a cooling tower 30m up in the air, with only ladder access, exposed to the January weather. Well done to the whole squad for a good job done safely. It's good to start the Year with a large job as generally it takes a little time to get back to normal after the Christmas / New Year holidays. 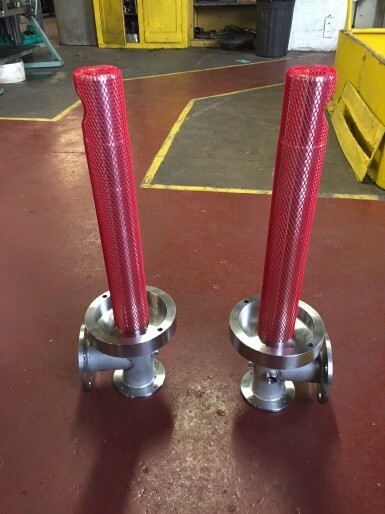 This Year we are fortunate to have won a contract for the removal of 1,500 heat exchanger tubes and tube plate within a large heat exchanger durring the annual shut down at a local factory. To meet the delivery period we are having to work around the clock on the job which is located 30m high on an access scaffold with little or no protection from the weather. Part of the job is within a 'confined space' so safety training was carried out before the job started to comply with the customers requirments. Each tube is 76mm diameter and 3m long so a lot of the work is getting the tubes up into position! We were delighted to receive a Scottish Engineering Safety Award earlier this month. 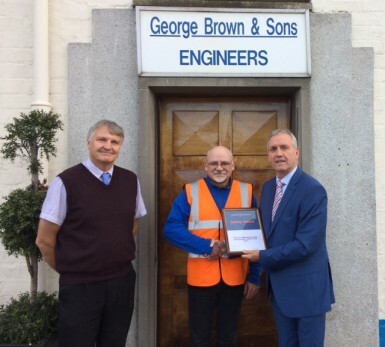 The picture shows the certificate being presented by Mr Raymond Lowe of Scottish Engineering to Mr Alan Dall our Health & Safety Quality Manager and Mr George Brown MD outside our front door. Alan Dall implements and runs all our safety systems and organises training for our employees whilst liaising with our customers safety and quality departments. This year was the 200th anniversity and a plaque was unveiled to commemorate the occation along with the full Royal Marines Band and numerous dignitaries. We had our formal Company AGM today in our offices with Directors, share holders and our auditors in attendance. Retired Director Bill Kerray turned up and he is enjoying his hard earned retirement having worked for 40 years with us. One of the auditors is the grandson of a former employee, Douglas McGlinchey, who served his apprenticeship with George Brown & Sons between 1945 and 1949. 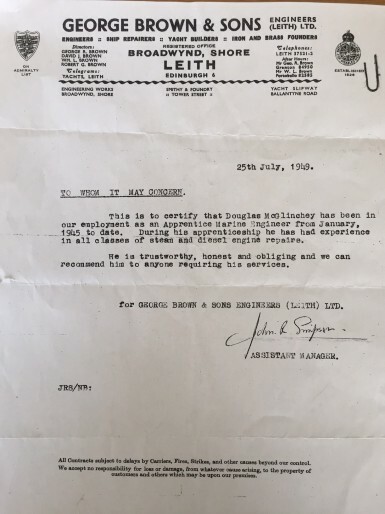 Attached is his referance from the Company sighned by Johnny Simpson who some of us remember from the early 1970's. In those days we had three yards, the engineers at Broad Wynd, the 'top' yard for yachts and liferafts at Ballantyne Road, and our current premices on the Shore. 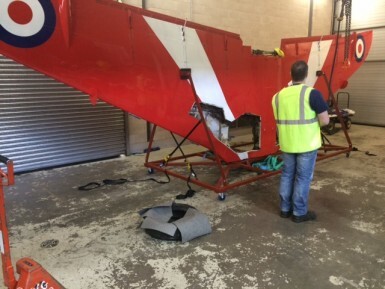 We recently deliverred a fabricated trolley to allow our customer to move the complete wing that has been taken from a plane formerly used by the Red Arrows air display team. The trolley is to be used to allow the wing to be safely moved into the National Museum of Scotland in Chambers Street, Edinburgh where it is to be part of a new exhibition. The trolley was fabricated with the appropriate load bearing castors and the wing carefully balanced so that everything lifted squarely. Once the trial was complete the frame was fully welded and painted. Another string to our bow making vintage aircraft propellers ! 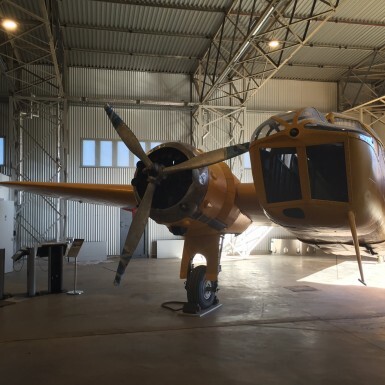 We were asked to manufacture replica propeller blades and hubs fo a twin engined Bolingbroke aircraft that is being restored and put on display at the National Museums of Scotland, East Fortune Aircraft Museum. The new blades , hubs and mechanisms were cast locally and we machined them to give a complete assembly for both engines. The final fitting took place on site with the propellers being slipped onto the output shafts from the engines, the complete mechanism is to painted on site prior to being put on public show starting this Easter. The East Fortune site is excellent and we are proud of our involment over the years with the restoration staff, we did a lot of work on site when they took delivery of a Concorde which is on display with many other interesting exhibits. The museum is well worth a visit. 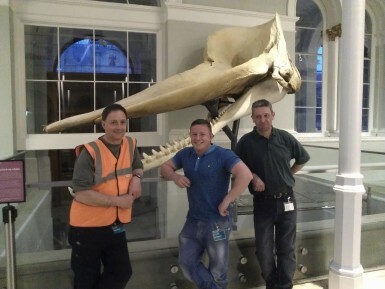 We recently moved four large Whales Jaw bones from a restoration workshop to a storrage facility. The weight of the bones varied greatly but the heaviest weighed 1500Kg and was about 5m long. The bones were wrapped to protect them from damaged whilst being lifted and transported. 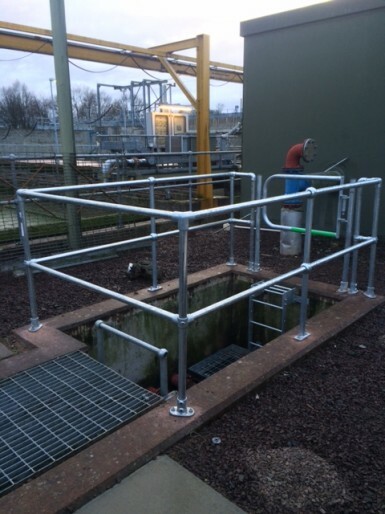 A nice job making and fitting on site a small galvanised steel platform with surrounding guard rail around a pit at a local Waste Water Treatment Works. 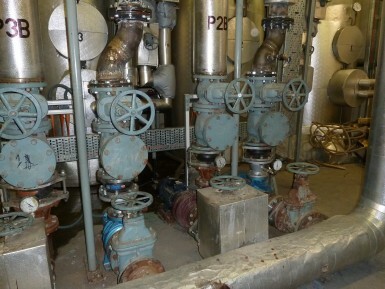 (Waste water is sewerage) The steel work was hot dipped galvanised so that corrosion is unlikely for the next 20 years. 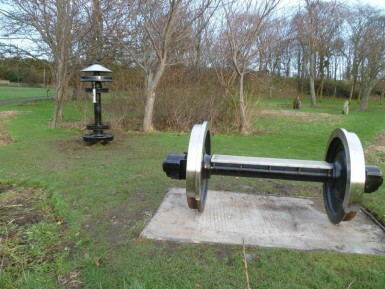 We have recently installed an unusual seat and bird feeder in conjuction with our customer Virgin East Coast Main Line. They donated two sets of old wheels from one of their trains from which we fabricated the furniture. Because they are in a public space attention to safety was paramount. Each is mounted on a substantial concrete base to ensure stability as each unit weighs 1500Kg, they have been clad in stainless steel to ensure maintenance is limited to replacing the bird food! 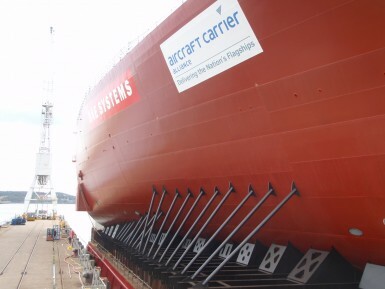 We are agian assisting in the work with the delivery of the prefabricated sections for the second aircraft carrier for the Royal Navy being assembled at Rosyth for the Royal Navy by Babcocks. 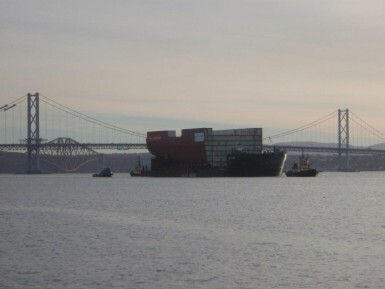 The largest section arrived last week after its voyage around the North of Scotland from the Clyde where it was built. On arrival the 11,000 tonne section has to have its sea-fastenings removed prior to discharging by gently sinking the barge , allowing the new section to be floated off. 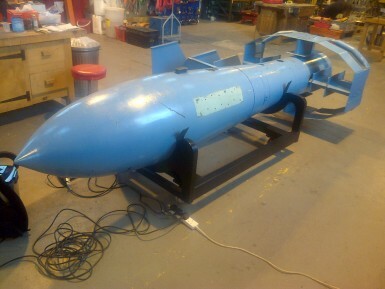 We were asked to fabricate a new trolley to facilitate the safe movement of an old wartime bomb. Thankfully the bomb was defused and perfectly safe ! We fabricated from steel profiles and some straight sections an attrictive trolley to allow the bomb to be moved easilly and desplayed to the customers requirments. The bomb dates from the 2nd world war and was a German designed 'fly by wire' bomb. We were delighted to be invited to attend the re-naming ceremeny of the powercar 'Craigentinny' to celebrate the depots centenary. The depot undertakes maintenance and repair of the East Coast Main Lines high speed trains that operate between Scotland and England. We have been working with the depot for many years now on various aspects of the maintenance work they carry out including many safety critical items. The teams involved work hard and conscientiously to maintain the levels required. Pictured alongside 'Craigentinny' are John Cheyne, Henry Boyd, Bill Kerray and Helen Johnstone. 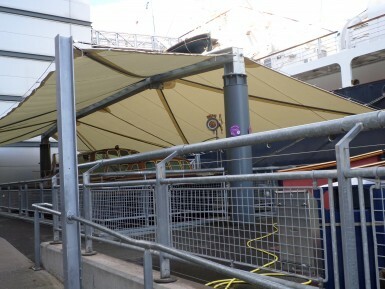 We were asked to design, manufacture and install a supporting steel structure to which stainless steel wires could be attached to accept a protective PVC canopy to protect the 'Royal Barge' which forms part of the Britannia Tour. The Royal Barge is in full working order and kept afloat in a special pond at the bottom of the gangway of the Former Royal Yacht Britannia. The Barge was transported to London in 2012 and led the pagent on the River Thames to celebrate the Diamond Jubilee of Queen Elizabeth. The fabrication work was completed in our Shore workshops and was hot dipped galvanised before installation. To prevent any disruption to the daily tours of Britannia (over 300,000 per year) , all installation work was completed before 10am each day. We carry out an assortment of work for the FRY Britannia and she remains one of the best attractions in the UK. After the naming of the first aircraft carrier by the Queen earlier in the summer (we were not invited!) we have commenced work assisting with the unloading of the prefabricated sections for the second carrier which is to be built at Rosyth. The picture shows the barge loaded with a 5,000 tonne forward bow section that we are currently releasing prior to the barge being carefully "sunk" and the section floated off . 90% of the seafastenings are removed prior to the barge being moved to deep water where the final 10% are quickly cut. This is always a nerve wracking time as the 5,000 tonne section settles down with all sorts of groaning going as the final seafastening are cut through. There is always a quick scampering back to the work boat once the final cuts are made and the valves are opened to lower the barge! 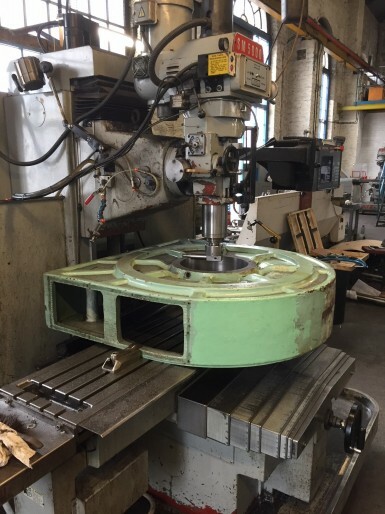 Due to larger components needing machined we have bought a refurbished 36" Webster Bennett vertical borring machine and installed in our downstairs workshop. This new machine weights 7.5 tonnes and will enable us to machine larger components that prevuiosly have had to be subcontracted out or the work declined. The machine has already been used for several jobs with several more scheduled. Thankfully several of our machine operators have used these machines previosly. 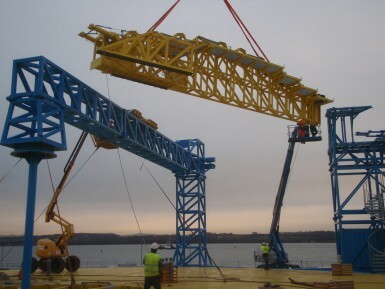 We continue to assist on the installation of the new carousel at Rosyth. Th main revolving table is now fitted and the ancillary equipment is now being erected and fitted as it arrives from the makers. 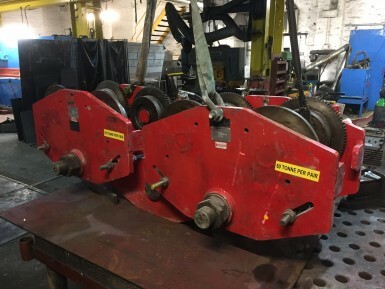 The first horizontal section of the overhead spooling arm weighing 18 tonnes was fitted yesterday at a crane radius of 30 m. All went well with all the bolts fitting as planned. The next sections will now be added along with the handrails and rollers. 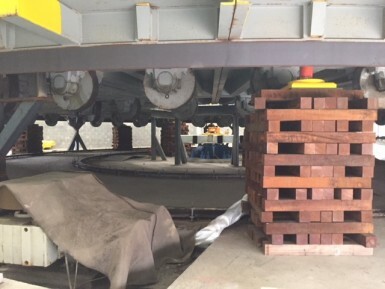 We have recently unloaded segments for a new 40 meter diameter carousel for one of our customers. A total of thirty segments, each 15m long by 3.5m wide and weighing 10 tonnes are to be unloaded from trucks arriving from Sweden each with two segments fortnightly apart. The work involves rigging and slinging of each section and then piggy backing the trailers for their return trip to Sweden. Full lift plans, method statements and risk assessments were put in place to allow the work to be timeously completed to each timetabled delivery schedule. The foundation of the new carousel has been constructed and installation work is due to commence in October when we hope to assist with completing the work with the supplier and the end client. The two Minor Light Structures for the Northern Lighthouse Board were loaded onto transport recently for delivery to their depot at Oban. The structures were complete with drilling templates and M36 stainless steel studs and fixings to allow them to be fixed to the rocks they are to mark. The structures are from marine grade stainless steel with GRP flooring and weigh in at three and two tonnes each. They will be loaded onto a crane barge in Oban, which will transport them to Plockton, where they will be fitted by contractors. 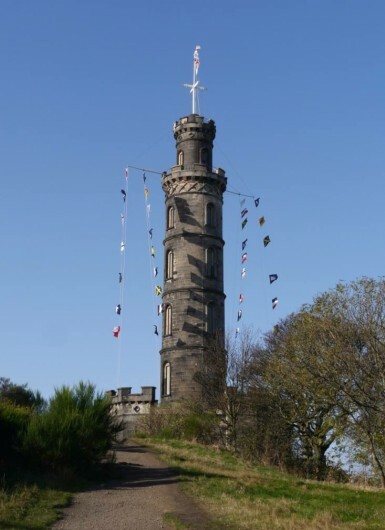 With the Edinburgh International Festival , Fringe & Tattoo about to start, we have been busy carrying out various contracts testing securing points for flag and banners up on the Royal Mile, as well as on other high profile sites. Securing points are proof load tested and examined using test weights or, in these awkward positions, using purpose-made hydraulic pulling equipment. 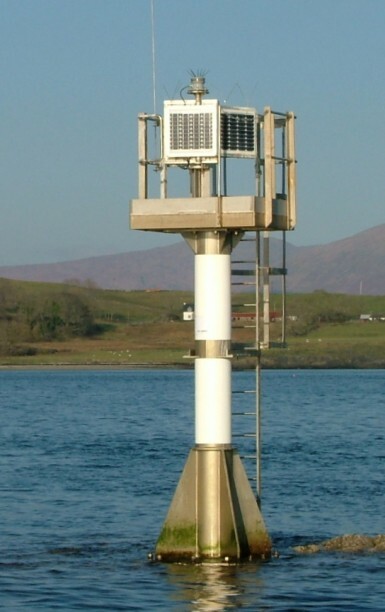 Following a competitive tendering exercise we have been awarded a contract by the Northern Lighthouse Board for the fabrication and supply of two stainless steel Minor Light Structures. Each structure consists of a thick base plate with large vertical tube that supports a platform with access ladder complete with safety cage. Each structure has a pedestal onto which will be fitted their light beacon. George Brown & Sons have not worked with the Northern Lighthouse Board for a few years but have previously supplied machined components, refurbished buoys and are pleased to be working with them again. The skull of a sperm whale found beached on the banks of the River Forth is now on display at the National Museum of Scotland. The 40ft whale known affectionately as ‘Moby’ became a cause célèbre after being sighted swimming up the Forth rather than out to sea. Rescuers, including BP tugs and the pleasure boat Maid of the Forth, tried desperately to push him back out to sea. Unfortunately their efforts were in vain and sadly Moby beached and died on the foreshore at Airth on 31 March 1997 - the first sperm whale to be stranded in the Forth in over 200 years. Following his death, Moby’s skeleton was prepared by museum staff and is now in National Museums Scotland’s Natural Science collections, which is home to several million specimens, including one of the largest marine mammal collections in the world. The one-and-a-half ton skull is displayed in the Grand Gallery, alongside fascinating artifacts including the Cockroft-Walton Generator and the 12ft long Tahitian feast bowl. George Brown & Sons were given the task of fabricating a mount to display Moby’s skull and lower jaws in the Grand Gallery at the National Museum of Scotland. We recently assisted Babcock Commercial at Rosyth with the lifting into position of the replacement crankshaft for the Northlink ferry, Hamnavoe, which operates between the mainland and the Northern Islands. The crankshaft weighs 5 tonnes and is seven metres long. It had to be lowered through a hole cut on the car deck and then fleeted through an internal bulkhead into the engine room. Delivery period for a replacement is 6 months, so no room for mistakes! Well done everybody involved. We are constantly upgrading our processes and facilities and recently took delivery of a new 1.75m bed XYZ semi automatic lathe. This replaces a slightly older, smaller unit that has worked well over the last seven years. The new lathe has an upgraded operating system, which will simplify the programming of the machines. 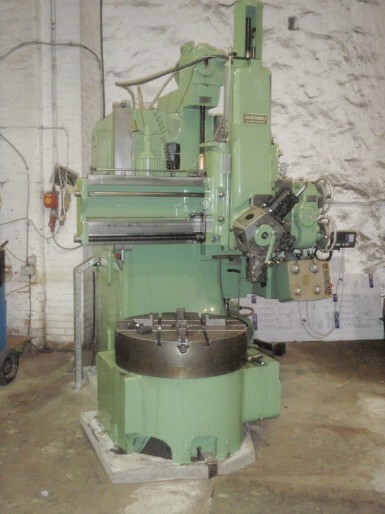 We now have two similar lathes that are ideal for both jobbing work, where single components are manufactured or modified, and production work, where small batches of similar components are manufactured. They complement our two XYZ bed and milling machines. 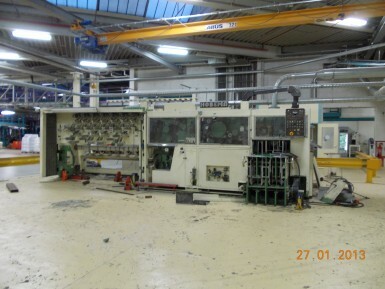 We went over to Koblenz in Germany to dismantle a Hobema paper folding machine from the Kimberley Clark paper factory. 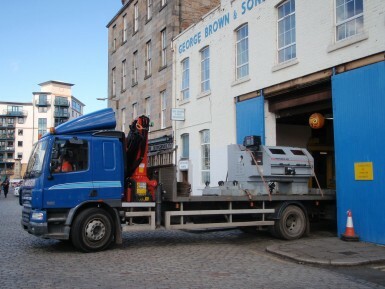 The machine was then shipped back to the UK, where it was re-installed at the customer's site in Loanhead, near Edinburgh. We were asked by the owners of the Royal Yacht Britannia to design and construct an adjustable steel cradle to support the classic racing yacht Bloodhound on the quayside during a 2 month refit programme. The Bloodhound was formerly owned by the Queen and Prince Phillip and is on display alongside the Britannia. 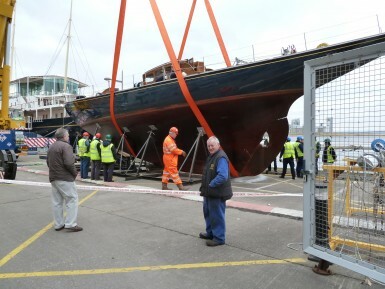 Here you can see the 34 tonne yacht being lifted into the cradle by Bernard Hunter Crane Hire with our fabricator, David Nichol, looking on. 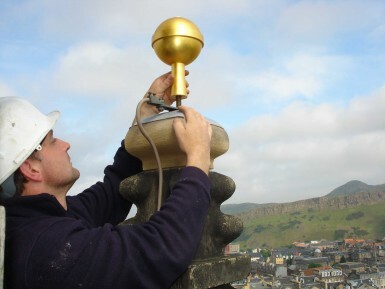 Following a student prank, three gold-plated copper spheres disappeared from the lightning conductors at the top of St Giles' Cathedral and George Brown & Sons were asked to replace them. Using copies of the original 100 year old drawings, exact replicas were manufactured, gold gilded and fitted back in place to help protect the thousand year old building from lightning strikes. 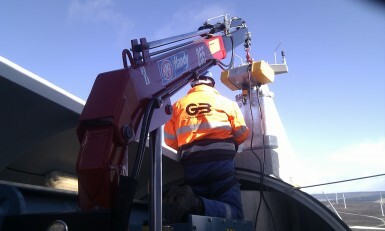 We went to the top of a 65m turbine at Towie Wind Farm to pre-inspect securing bolts on a swing-away davit arm. After swinging out 90 degrees and lowering the chain to ground level, we hooked a 500kg safe working load for deflection measurement before applying a 625kg static load. The data plate was then stamped & fitted. 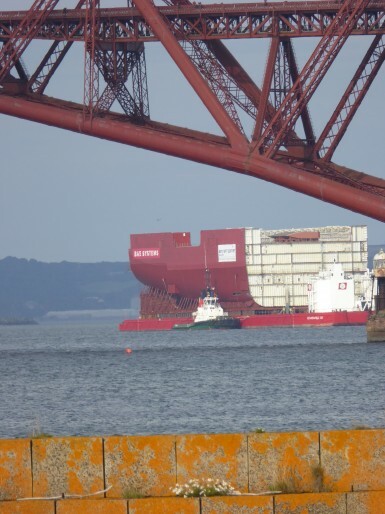 The final and largest hull section for HMS Queen Elizabeth arrived at Rosyth and we are providing labour to remove the seafastenings securing the section to the transport barge. This will take around six twelve hour shifts prior to the barge being 'sunk' and the 11,400 tonne section floated off to be joined together with the other sections previously delivered. The transportation barge will then be raised and the extensive steel grillage removed and the deck completely cleared by oxy acetylene gouging. George Brown & Sons have been providing labour for the aircraft carrier project since the arrival of the initial sections two years ago. In October we completed the first stage of pipework modifications to allow installation of 6 new heating circulating pumps by heating engineers Linaker Ltd. 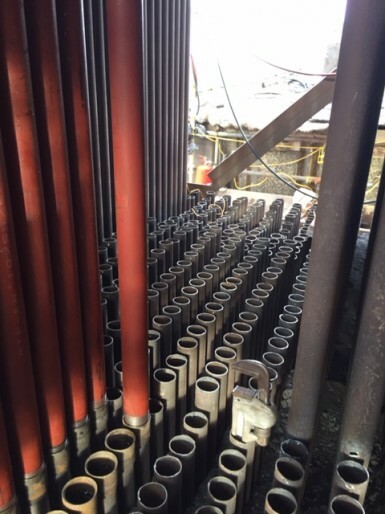 The installation work involved two separate visits during which the hotel hot water and central heating systems were drained down whilst we welded 6” diameter steel pipe offsets in place to connect the hotels original pipework to the new pumps. The work was carefully co-ordinated with Linaker and the welding work was completed inside the target time ensuring minimum inconvenience to hotel staff and guests. 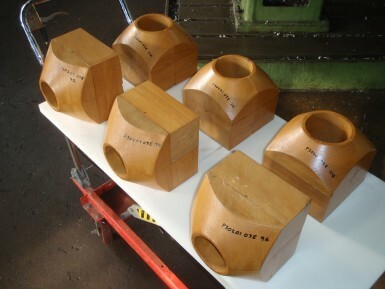 We recently carried out the manufacture of six split wooden dies for one of our valued customers. The blocks started as lengths of Opepe hardwood which were cut to length and epoxied together prior to splitting and machining in our semi-automatic lathes. The final units were dowelled together, sanded and varnished prior to delivery. 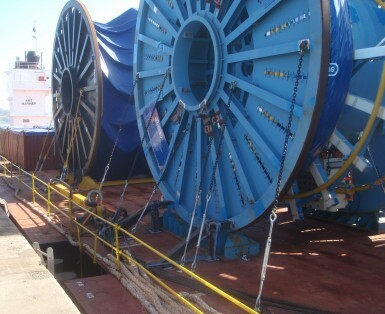 We have been awarded the contract for the supply and fitting of the seafastenings to several large umbilical reels by Saipem, the oil & gas contractor . The contract involves the supply of approximately 30 tonnes of fabricated steel seafastenings and securing the cargo onto the deck of their shipping barge for safe transit to their Burullus contract currently being undertaken in Egypt. Babcock have awarded George Brown & Sons the contract to undertake the refurbishment of the hauling chains that open and shut the two entrance gates into the Rosyth Naval Base basin. The contract is expected to take 6 months commencing March 2012. Following an intensive audit procedure by international oilfield services provider Technip we have now been awarded their 'green light' status ensuring we can continue our successful relationship as a supplier. 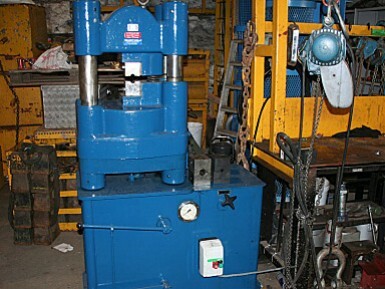 We have invested in a Talurit 350 tonne wire rope press, allowing us to make wire rope slings from 10mm to 30mm diameter. This will save a lot of valuable time for our customers, as we will now be able to manufacture the slings in-house. 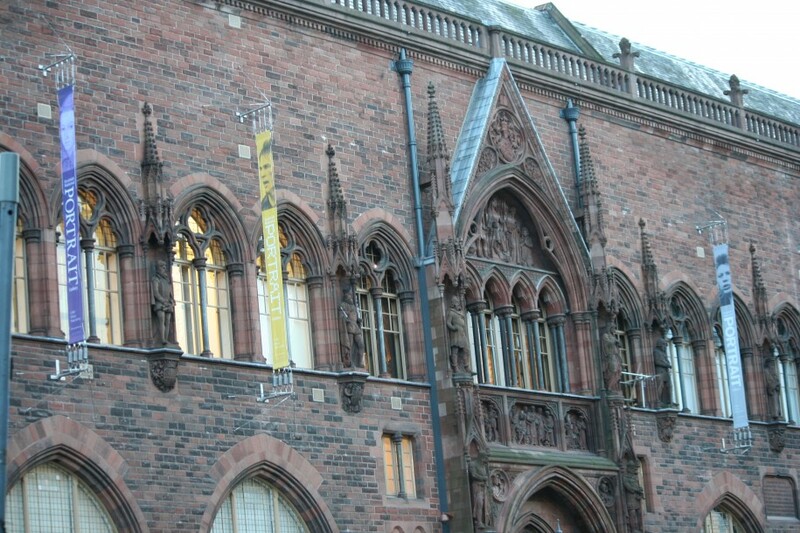 Braving November’s cold, we worked hard to manufacture, fit and test the brackets before erecting the banners outside the Scottish National Portrait Gallery in time for its grand reopening. We supplied all the rigging gear and pressed the securing wires for the brackets in our Leith test house to ensure they met our high standards. We spent two weeks working through the night, testing the fixing points to fit steel plates for the hanging of wire ropes to hold this year’s Christmas lights on George Street. 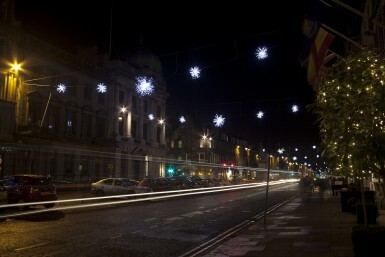 As Edinburgh Council wanted more lights, five extra wires and fixing points were manufactured, tested and fitted. 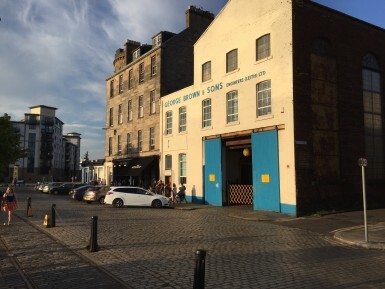 George Brown & Sons Engineers (Leith) Limited. 5-6 Shore, Leith, Edinburgh, EH6 6QS, Scotland, UK.